This is not another version of a battery bank case. It is much more then that! 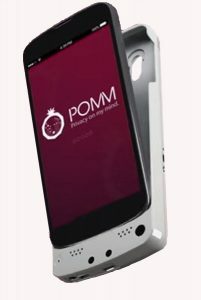 The secured case includes powerful microprocessor, huge storage memory, few biometric sensors and plenty amount more of hi-end electronics. It is also occupied with its own high capacity battery. It communicates with your smartphone through a secured USB port. Its mission is to be constantly attached to your smartphone and to hold your private data on its memory in ultimately secured manner rather than in the smartphone memory. Camera module – miniature camera for face recognition. GSR sensor – Galvanic Skeen Response (sweating sensor) for liveness verification. IMU – inertial Measurement Unit (acceleration, Gyro) for signature verification. Secured boot – automatically erases the boot sector upon tampering detection. Password key exchange and secured USB communication. Tampering protection – automatically erases the storage upon illegal attempt to open the case. microHDMI – to display images on an external large screen after authentication.